On Saturday afternoon, February 15, about two dozen of us gathered in the foyer of the Agriculture and Agri-Food Canada’s Neatby Building in eager anticipation of a tour of the Canadian National Collection (CNC) of Insects, Arachnids and Nematodes. The CNC is one of the largest insect collections in the world, with 17 million pinned specimens stashed away in cases piled high in special cabinets. The collection is so heavy it has been moved into the oldest and sturdiest part of the building. Three of the 16 entomologists currently on staff, Drs Owen Lonsdale, Hume Douglas and Jeff Skevington, were on hand to divide us up into groups. I was in Owen’s group and our path barely crossed those of the other two. 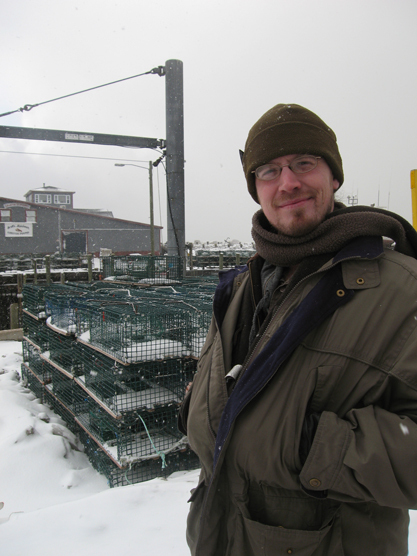 Owen is the manager of the CNC and a keen, enthusiastic researcher exploring the minute worlds of Dipteran families most of us rarely see. He started us off in the molecular lab, explaining that entomologists are relying increasingly on molecular and DNA studies for species identification and evolutionary reconstruction. Sometimes physical differences between species can be very small but the behavioural differences very large: two insects that appear identical could be polar opposites, one being beneficial (a pollinator or an insect that feeds on pest species) the other being a pest or parasitoid of beneficial species. Millions of dollars worth of agricultural production can ride on getting the species identified correctly. From the lab we went straight into the labyrinthine collection, starting with some of the largest and most beautiful of the Lepidoptera. 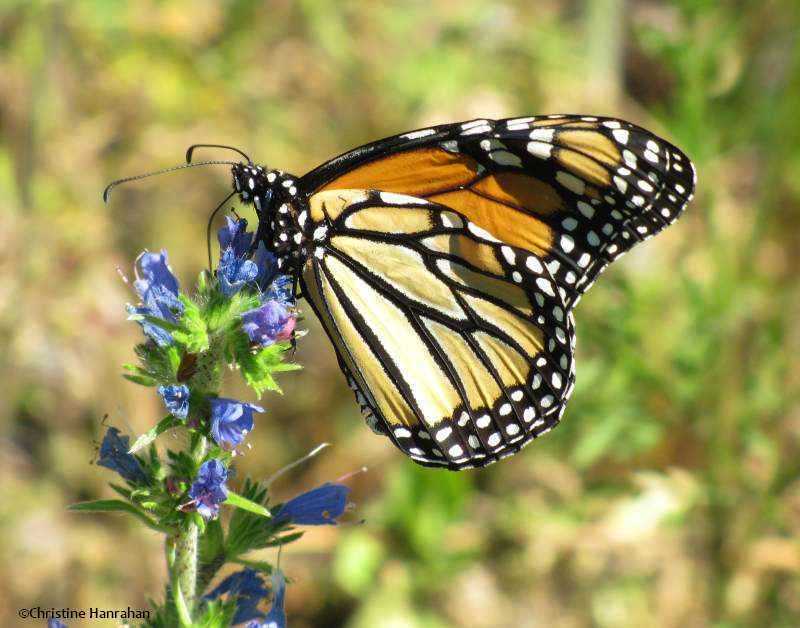 Owen noted that while butterflies get most of the attention, moths form by far the largest number of species. In fact, butterflies are actually diurnal moths, a rather surprising description for we amateur entomologists. We surveyed a wide range of other insects, from Odonata – no one on staff is currently working with them, unfortunately – to various genera of Diptera, including robber, horse and flower flies, the latter being an interesting follow-up on Flower flies!, Andrew Young’s presentation on the Syrphids. One person in our group was a very keen lad, too young to join the Macoun Club but allowed in anyway – he’s that enthusiastic. Full of questions and eager to see everything, he pretty much glued himself to Owen so as not to miss a thing. I understood his passion and was happy to see him enjoying this opportunity, not available in my day. We stopped in at Owen’s lab, where his microscopic work includes sketches of the genitalia of the Diptera he is identifying. Each sketch can take up to 8 hours to make and, by my calculation, if he does nothing else and collects no other species, he will finish his drawings on one project in particular in about 2 years. His art background, he explained, enables him to combine two often conflicting areas of interest, the arts and sciences. Owen explained how the collection is organized, from the accurate labeling of every item and the conventions around creating scientific names to the importance of holotypes, the insects first described for a species that become the standard for identifying others in the same species. He also outlined how the CNC can be used to study diversity, the evolution of species and their taxonomic relationships, species biogeography and radiations, insects as vectors of disease, the impacts of habitat loss and climate change. The CNC’s primary mandate is to support agriculture, protect Canadian bioresources, investigate problems such as pests, detection and control invasive insect species, and protect agricultural production. Those tiny insects we generally never see cause billions of dollars in damage to food stocks and forest resources the world over. The Emerald Ash Borer is but a recent example, which likely entered North America accidentally as larvae in wooden packing materials from east Asia. For this retired historian, Owen’s comments on the literature were as interesting as the collection itself. He pointed out several of the manuals on various orders published by the CNC and in use around the world. 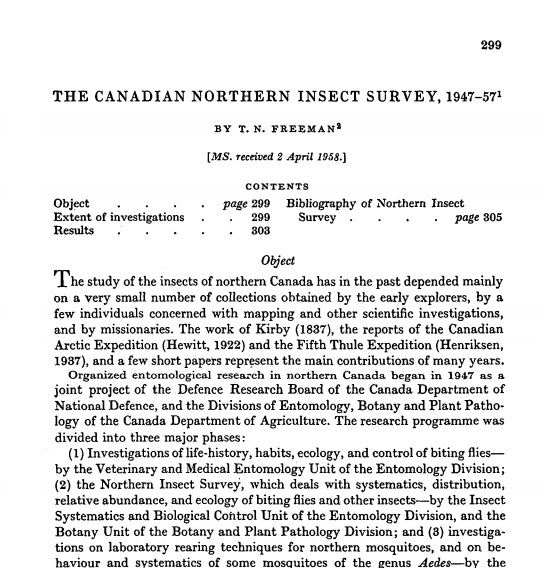 These include the three-volume Manual of Nearctic Diptera, published between 1981 and 1989, and now available online through the website of the Entomological Society of Canada. The CNC has shelves full of boxes containing published articles from around the world that are not yet available online, a huge and growing literature that still only scratches the surface of the entomological world. Some 1.5 million species have been described, but estimates of total species range from 10 to 30 million. The collection of insects in the Canadian Arctic during the Cold War was a particularly interesting story: soldiers and others stationed on the Dew Line sought help from the CNC for dealing with the black flies and other biting critters driving them mad. The result was the Northern Insect Survey, with a small army of 49 entomologists collecting not only the offending beasties but anything else they could find – all still tucked away in the CNC. All in all, this was a fascinating afternoon that went by too quickly. These tours are offered from time to time, so keep checking the OFNC events info. I for one plan to come back! 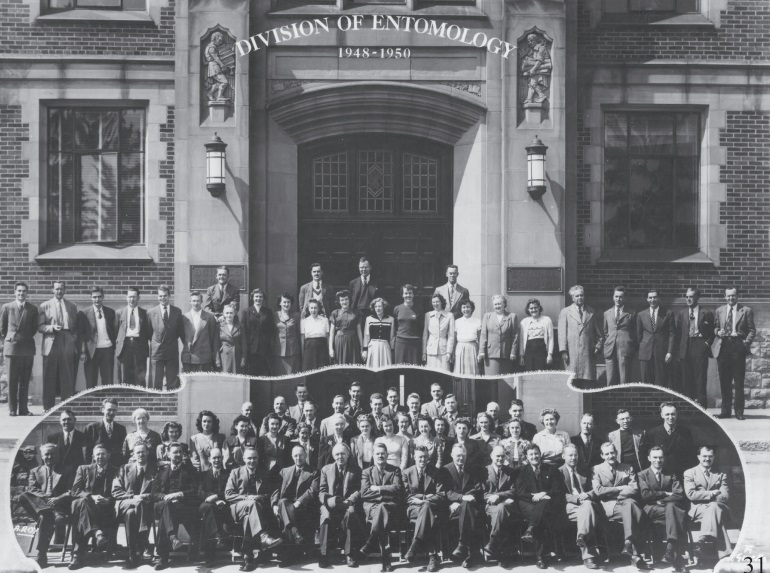 If you want to know a whole lot more about the history of the CNC, check out Owen’s item in the Newsletter of the Biological Survey of Canada.